Incase you didn't know already Halloween is my favourite time of the year, everything about it just puts a smile on my face. You can also bet your bottom that I am currently counting down the days! I've got the day off work for the holiday which I'm so excited about and so today I thought I'd show you my current four essentials for this Autumn weather we're having. 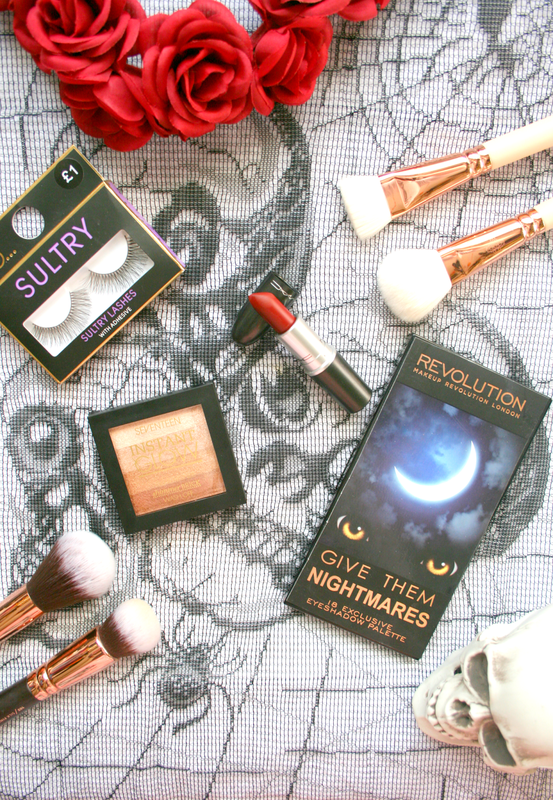 Firstly of course I couldn't go through Autumn without using the Makeup Revolution Give Them Nightmares eyeshadow palette. It consists of mostly purples, blues and greens which I absolutely love for this time of the year. Wicked witch colours for the win! I adore these shadows as they are so pigmented and blend so beautifully. Something else I seem to wear alot of during Autumn is some False Lashes I just think they really complement the eyeshadow colours. My absolute favourites right now are the Primark's own brand Sultry ones. These are literally so hard to find as they are so popular so when I come across them I normally pick up a few to stay in stock! I have been absolutely adoring the Seventeen Instant Glow Shimmer Brick* this just gives the most gorgeous bronzey glow to the face and since the weather is colder and well...the sun has stopped visiting I'll do anything to keep my skin glowing. Finally a dark berry toned Red Lip and the Mac Russian Red is my current go to. The colour is absolutely perfect and what I love about it is it really exaggerates the whiteness of my teeth. This lasts for ages and I just cannot get enough of it! What are your current makeup essentials? Russian Red looks the perfect Red colour I love it! The Shimmer Brick looks gorgeous, I think I might need to go pick that up as I love Seventeen! Russian Red looks like the perfect shade of Red too! I love the look of the false eyelashes and I really want to try MAC Russian Red!